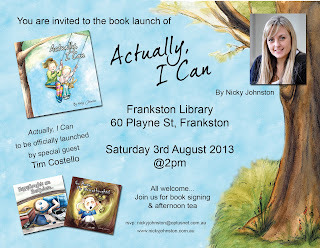 Nicky Johnston’s latest children’s book, Actually, I Can is due to launch this Saturday at 2pm. This is Nicky’s third book, after her previous titles, Go Away, Mr Worrythoughts! and Happythoughts are Everywhere, which were all written to help children deal with anxiety. After observing that her young son demonstrated signs of anxiety, Nicky struggled to find resources suitable for children with similar experiences to her son, which is what inspired this experienced primary school teacher to write her first book, Go Away, Mr Worrythoughts! (published in 2008). Actually, I Can is the story of two friends – Amelia (free-spirited and carefree) and Connor (who always worries) and how their outlook influences their lives. “Actually, I Can shows little worriers how they can work through their anxieties and learn to just be a kid having fun. Many parents tell me they struggle just like I did to find practical support to help their children. My books are written to help children open up about their worries and give them and their parents the tools to help deal with anxiety and worries,” says Nicky. Tim Costello, Chief Executive of World Vision Australia, will be the guest speaker at this wonderful event. RELEASE DATE: 3 August 2013RRP: $16.95ISBN: 978-0-9870926-7-0 Available in all good bookshops. 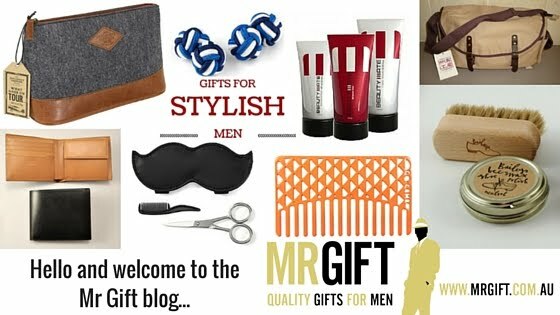 Check out www.nickyjohnston.com.au for more information or Nicky's Facebook Page. This one’s for anyone who’s been hiding away inside all winter. Get Active August was an initiative developed by mother of two and business owner Lauren Angove to help busy people (parents in particular) get out and get active. Her youngest son turns three in August, and this has motivated her to work towards her pre-pregnancy weight and energy levels. Lauren is the first to recognise that we’re all busy and constantly juggling and trying to find balance in our lives. “Yet being active is so important for our health, self-esteem, state of mind and energy levels – which in turn helps us deal with the daily stresses of family life,” she says. The key, says Lauren, is identifying that “being more active doesn’t necessarily mean you need more time…There are some great ways to work more activity into our day-to-day life and be more active as a family together.” August is a great time to start an initiative like this, as the days are getting longer and warmer. “Families usually find it more difficult to be active in winter too, so with spring around the corner it’s time to start thinking about how to get the family more active and stay active no matter what the weather outside,” says Lauren. Get Active August challenges parent to get active for 15-30 mins each day with their kids, and the program offers ideas on how families can do this – indoors and out. - ‘Like’ the Kids Around Perth Facebook page and to keep up to date with Lauren’s 15-30min family activity suggestions, as well as activities from family-friendly businesses in Perth. - Register to attend the Kids Around Perth Get Active Family Meetup, August 18th, at Jackadder Lake Reserve, Woodlands. Bring a ball, skipping rope and frisbee, or any other items that you can use to get active. There will also be other organised activities on the day. Spots are limited, so make sure you register to avoid disappointment. The Australian Hotel and Brewery Rouse Hill are getting ready for their third Brewery Birthday Bash this month. They'll be fire trucks, farm animals and fast cars. The Brewery Birthday Bash is a family affair that's run in conjunction with The Variety Bash charity and cars participating in this year’s Bankstown to Ballarat Bash will also be on display. With an award winning bistro, the Brewery is looking forward to doing what they do best – “Families, Food and Fun”. -‘Nuts in Balls’ – the kids can climb into a clear ball and experience walking on water. As a long-time listener and fan of The Wellness Guys (Australia's #1 health podcast), I was excited to see that the guys will be appearing at The Wellness Summit at Crown Melbourne this month. “Ten of Australia’s most dynamic health warriors will team up” for The Wellness Summit and focus on promoting better health and wellbeing by identifying and kicking bad habits. Bluestone Restaurant Bar on Flinders Lane has established itself as one of Melbourne’s favourite CBD eateries. Bluestone is ‘giving thanks’ for their 13 years in business with a Thanksgiving Dinner celebration. USA-born Executive Chef Cody Cunningham is drawing on his heritage to create an American-style feast including: roast turkey, corn on the cob, and of course, pumpkin pie. “I cannot wait to bring a bit of my homeland to Bluestone’s guests on the night,” says Cody. BrisStyle is a Brisbane-based non-profit organisation founded in 2008 “through a shared love of creating beautiful things”. Most members sell their gorgeous creations on online handmade superstore, Etsy.com, but occasionally they showcase their work at the BrisStyle Indie Markets. BrisStyle has organised two great markets in August: BrisStyle Indie Markets at Brisbane City Hall and BrisStyle Indie Twilight Markets. The second part of the three-part Monks Millionaires and Money series is set to take place at the Art Gallery of NSW, Sydney this month. • Dr Avnesh Ratnanesan – Founder of Energesse, social change agent, entrepreneur, visionary, success magnet. Dr Ratnanesan (or “Avi”) comes from a traditional medical model until, one day, his whole life shifted. He’ll speak about how he discovered his purpose. • Luke Dixon - Divine Union, musician, thinker, philosopher, intuitive. • Lindsay Drummond – Divine Union, musician, provocateur, creator. • Julian Noel - Founder of Shine. Hear from Julian’s story and why Shine! Writing a book is on my lifetime ‘List of Goals’. The problem with this goal is that I just wouldn’t know where to start getting my book published once it was completed. Publishing Queen, Kylee Legge believes that part of the success of publishing in a book lies in starting your marketing process before you even start writing. Clearly focusing on your end market will reduce your publishing costs by creating momentum before your book even hits the shelves. “Remember to also start your publishing process with the end in mind by marketing before you even put pen to paper so you can use the pre-sales of your book to fund the costs of the publishing process so you don’t need to spend any of your own money to get the ball rolling,” advises Kylee. In her FREE one-day seminar on 17 August, Kylee elaborates on this strategy further, whilst sharing other publishing gems that will help you create your publishing plan. Book your spot today at: www.thepublishingqueen.com/seminarsydney or check out www.thepublishingqueen.com for more info. The Parkinson’s NSW Unity Walk and Run is a great opportunity to get out and enjoy Sydney’s beautiful Olympic Park, whilst staying active by participating in a 4km or 8km run, or a 4km walk. Money raised from this event will go towards raising awareness and finding a cure for Parkinson’s, whilst also supporting people living with this disabling disease. Participants can also look forward to group exercise activities such as Zumba, yoga and tai chi, as well as the chance to win a six night holiday to Hawaii. The first 1500 walkers and the first 500 runners to register will also receive a 6th anniversary Unity Walk t-shirt. Visit www.unitywalk.com.au or www.unityrun.com.au for more information and to register. If you’re in the process of organising a wedding, check out this contemporary version of a wedding expo. Couples can look forward to an interactive wedding planning experience by playing games and participating in fun activities. This is one of four seasonal Wedding Arcade events to be held this year, and this one is themed “The 4 Seasons”. There’s also a chance for guests to win over $7000 in flyers.